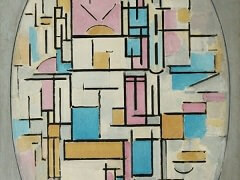 Broadway Boogie-Woogie is the last painting Mondrian completed. 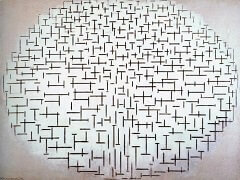 In the early phases of its genesis, the two 1942 drawings in the Newman Collection, it still shows many points of coincidence with the painting preceded it, New York City I. 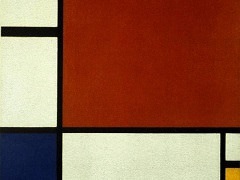 In the preliminary studies mythm of the painting is determined by the long lines of the grid, while other accents indicate the insertion of little bands of unbounded color, characteristic of the enlivening alterations that Mondrian made in New York on the paintings of his last years in Europe. 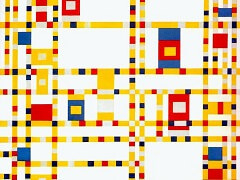 One example of a painting so changed is Composition London, which in its present state - that is, after the changes Mondrian made on it in New York - must be roughly contemporaneous with the Broadway Boogie-Woogie sketches. In the completion of Broadway Boogie-Woogie the same sort of process took place as in the final reworking of Composition London. The painting seems initially to have been based on lines, mainly yellow, running through it (and in this respect closely related to New York City I) and on some connecting bands of different color, which brought about a change in direction and proportion. 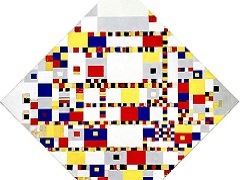 To this basic composition were added small blocks of red, blue, gray, and sometimes the same yellow as the traversing lines, giving the whole a new tempo, an entirely unexpected movement, a bouncing staccato rhythm. This new tempo is perhaps the most striking aspect. 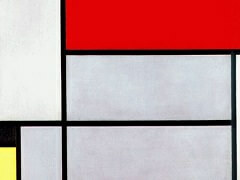 Whereas Mondrian's early paintings were built up out of long continuous lines and large planes, which could be compared to whole or half notes in music, there now appear much smaller forms, comparable to eighth and sixteenth notes, contrasting only here and there with larger areas. This innovation, which evidently took place while Mondrian was working on the painting, gives the canvas a new and sparkling vivacity. 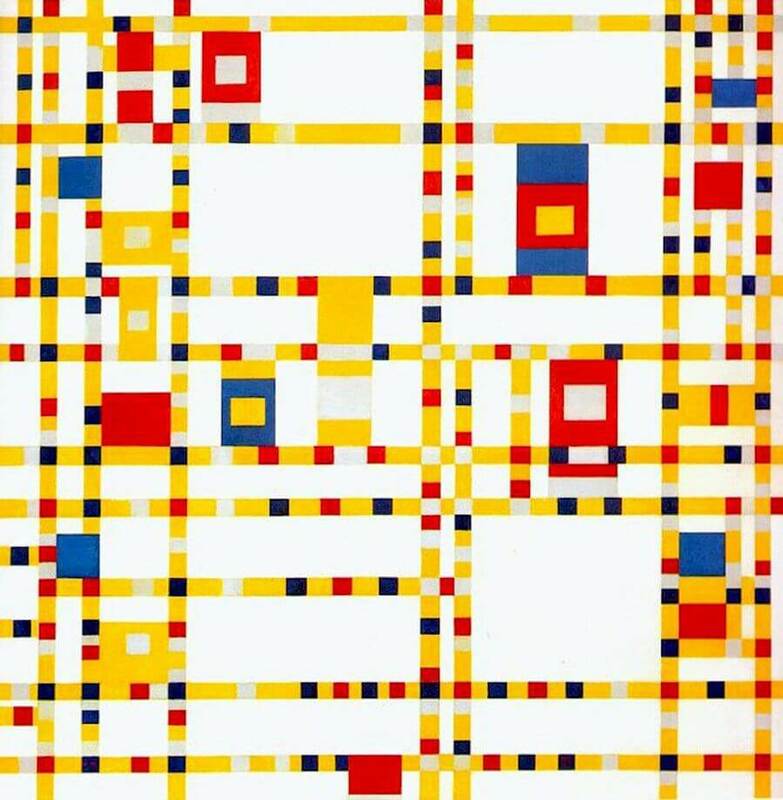 One of the reasons for this renewal in Mondrian's work is without doubt reflected in the title: boogie-woogie music, with its unexpected syncopation of rhythm, is elaborated visually in this painting. 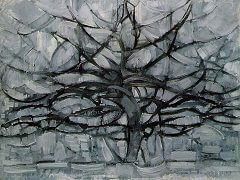 Passionately devoted as he was to dancing and rhythm, Mondrian had always been attracted by the latest in ballroom music, advocating the tango and one- and two-steps over the waltz. In the late 1920s he named two paintings Fox Trot A and B after the popular American dance recently introduced into Europe. And boogie-woogie obviously had a profound impact on him. Nevertheless, the most important factor in the origin of this painting, and of the "mutation" in his art, must have been the experience of the daily rhythm of New York itself, the pulsating movement that animates Broadway, especially at night, and, in thorough keeping with the old principles of De Stijl, creates a harmony out of the opposition of contraries. 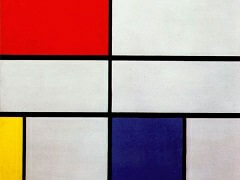 The painting is now owned by the Museum of Modern Art.